In case of a requirement that single duct legs or wall openings has to be open in normal operation and to be closed in a pressure wave (produced by chemical reactions, gas-explosions or mechanical damages at pressure vessels) resp. a pressure increasing situation, Krantz recommend to use of their pressure surge damper. Pressure surge damper of sturdy design, dimensioned for shock waves up to 0.5 bar. The function remains unreduced after a shock wave. According to the closing pressure an initial tension will be adjusted at an installed spring system. This initial tension ensures an open position of the damper regarding wind blasts and variation of pressure inside the duct system. 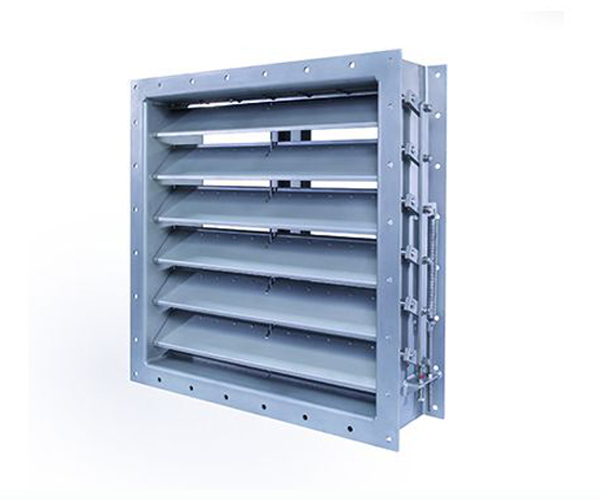 In open position and case of installation outside of outer walls the damper also fulfils the functions of a rain protection grille.